Australian miner Rob Elcombe, who had gone on a cruise with his wife, Tracey to save their marriage. The couple found themselves trying to save their lives instead when Captain Francesco Schettino drove the 10-story ship into the rocky Tuscan island of Giglio, ripping a catastrophic 160-foot gash in its hull that sent the boat tumbling onto its side. 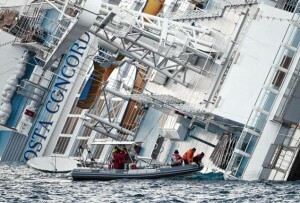 The ship, with more than 4,000 people on board, capsized after hitting the rock close to Giglio, off Italy’s west coast. At least six people were killed. Mrs. Elcombe said the deck of the ship was partially submerged by the time she and Mr. Elcombe eventually got into a lifeboat. Crew members had to drag the couple into the boat. “We were the very last people to be on there (the ship) apart from the crew,” Mrs. Elcombe said.